We really liked the novelty of previous scented Jelly Belly skin cases for mobile devices. We've now got our hands on the iPhone 5 Jelly Belly Case and were initially looking forward to this entry, but unfortunately it has a few problems. Lets start with the design. This is where the problems all present themselves. The case is constructed from a rugged translucent silicone which is rather well themed as it's quite a jelly like material. It's a thin material and is very easy to apply and remove onto the iPhone due the flex. However the case is simply not tight enough along the edges, so the top, bottom and right hand side sink a little backwards. The more we used the case, the more noticeable it became. When holding and using the case it feels very comfortable, as the silicone is smooth and glossy. The screen and bezel aren't introduced in anyway, which we always prefer as it makes using the iPhone serene. The looseness is of course ascetically annoying and is a concern in terms of protection. 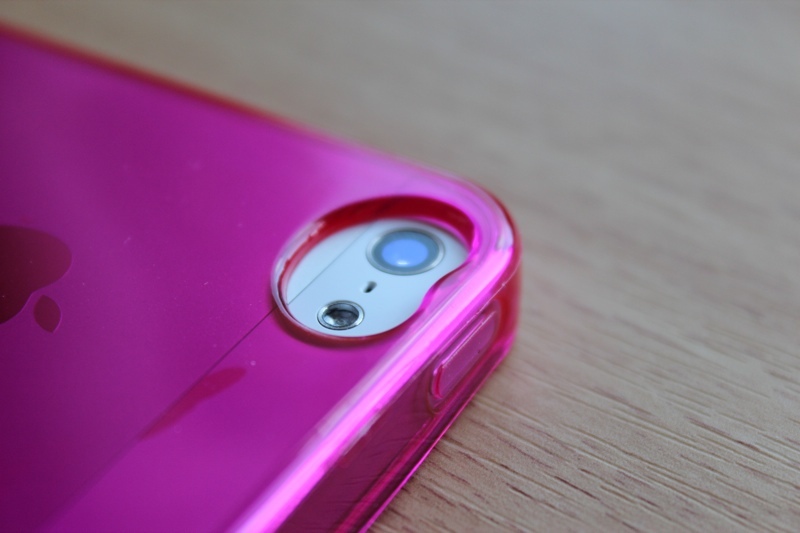 We tested to see if force would make the iPhone 5 come loose from the case. We couldn't make this happen, the phone is very secure as the edges lengthways secure the iPhone in place. The thinness of the silicone is fantastic at preserving the thin and light iPhone 5 design. But will only add layer of protection to scratches and light drops. The screen is completely exposed and if we were to drop the phone within the case face down, it would only hover a little above the ground, as the bezel only protrudes ever so slightly above the screen. The case has cutouts along the sides to allow for easy and convenient access to the volume rockers, mute switch, Lightning connector, stereo speakers and auxiliary input. Two holes either side of the speaker grills are covered via the case, we never like seeing speakers covered from a case in anyway. The sleep and wake button is deliberately covered via the case and is quite subtle and light in function. The rear iSight camera and flash are also cutout in the shape of a jelly bean, something all Jelly Belly skin cases incorporate and we rather admire. This cutout doesn't in anyway interfere with the cameras lens or flash. Moving onto the novelty inclusion which is the scent. So far the iPhone 5 cases come in nine flavours. Blueberry, bubblegum, grape, strawberry cheesecake (our case), very cherry, wild blackberry and blueberry. Each flavour reflects the colour of the case, so ours is a dark pink reflecting strawberry cheesecake. We've now had the chance to smell a good number of the Jelly Belly scented cases and this strawberry cheesecake edition is very prominent and realistic. After two weeks of heavy and constant usage the scent has remained strong. It's scent is meant to last for several months. It does rub off onto our hands and the iPhone, but isn't annoying as it's quite pleasant and just makes us feel hungry. Unfortunately this case isn't edible but the included 10g bag of Jelly Beans is. Overall the Jelly Belly Scented Case for the iPhone 5 is comfortable and functional. The scent is an appealing novelty but the loose drooping edges aren't.